Ever looked out of the window when flying and mesmarised by the view from above? Then as you approach the airport you start to descend and the world and you become one again. Brooklyn-based designer, Lauren O’Neil, has explored these structures via Google Earth. These high-resolution images are collected on the blog Holding Pattern. The collection is carefully curated to reveal beautiful compositions at airports that would seem to unnoticed at ground level. I’ve been fascinated by airports for as long as I can remember — there’s something about the comings + goings, the organization + operation … ultimately the systems of design at play … that’s so intriguing to me. Whether DCA, JFK, or the little municipal airport, I’ve always lived in a direct flight pattern of an airport. Day-to-day, I glance out my window and watch planes circle about waiting to land. During layovers, I often find myself observing the activity on the runway and thinking that I’d love to see this from above. 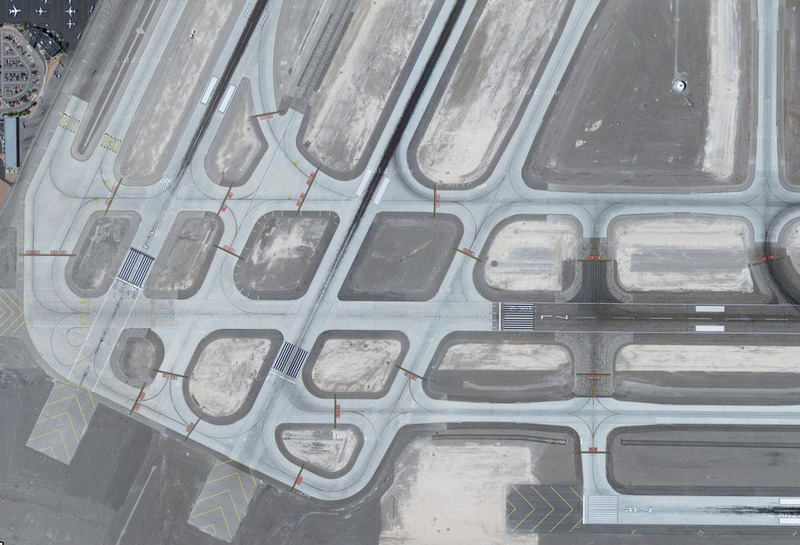 With a creative block on a project, I took to google mapping airports and was enamored by the beautiful satellite shots on my screen. Since then, wanderlust has often inspired me to get lost in the satellite imagery of various destinations even when I’m glued to my desk. So, that’s not exactly a ‘holding pattern’ you say … You’re right, but I love the idea of circling above an airport waiting to land. I feel like that mirrors my process of searching for + cropping the right shot. 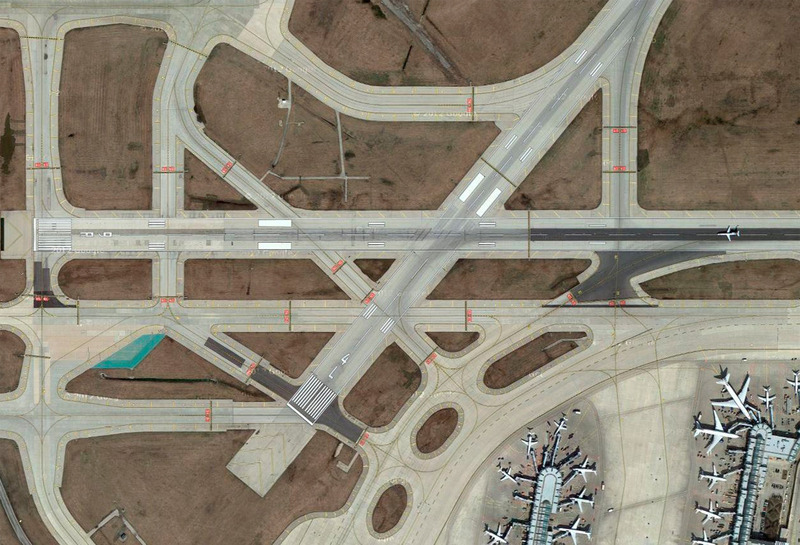 Plus, I love the fact that a lot of the taxiway markings and linework are patterned across an airport’s tarmac. Definition of holding pattern: noun – the flight path maintained by an aircraft awaiting permission to land. Airports use a specialised font to number their runways. It’s highly geometric, which eliminates confusing curves and can be reduced to simple schematics, making it easy for groundskeepers lacking typographic training to recreate. 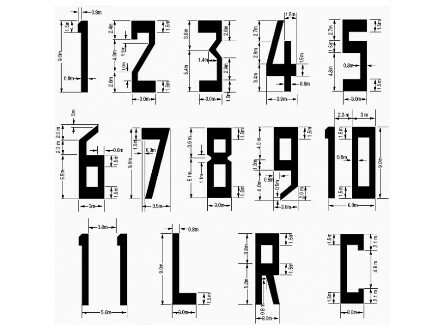 The font apparently has no name, but the numbers are called “runway designators” in pilot parlance. 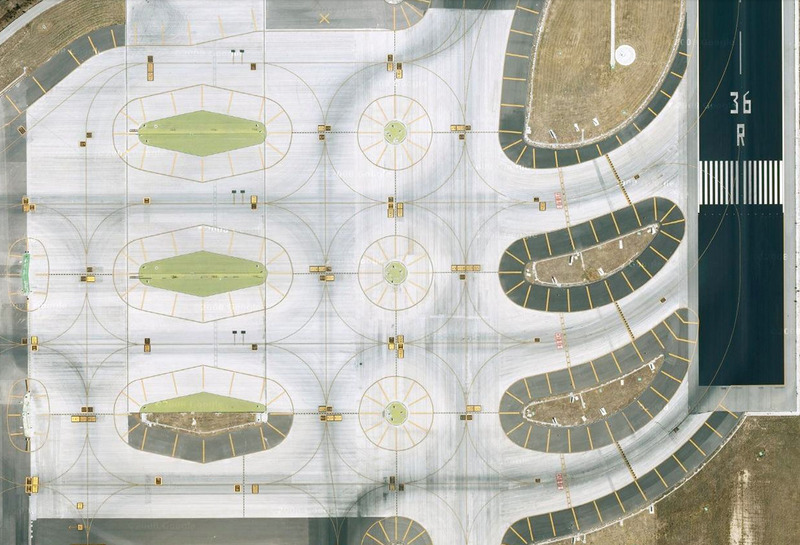 Dozens of carefully cropped images reveal common traits among airports, and the logic and order embodied by seemingly random lines becomes clear. Lines radiating like spokes around unpaved patches are common in many of O’Neil’s images and act as warnings to pilots to stay off the airport’s lawn. Many airports are built on soft soils, so a fully-loaded Airbus A380, weighing 230 metric tons at takeoff, will sink into a patch of sod quickly, requiring hours of recovery, repair, and rerouting. A runway, like most roads, has a center line. But there are plenty of markings unfamiliar to drivers. Eight white bars that resemble piano keys mark the threshold and give pilots an indication of where it would be safe to touch down. Two large white rectangles are the aiming points—the areas pilots should, well, aim for, followed by touchdown markers represented by four white bars. Chevrons at the end of the runway mark the direction of a given strip, but if your plane hits one during takeoff or landing know that a disaster was narrowly averted. They mark a displaced threshold — when the beginning of the landing area is not the beginning of the pavement.